Photo: Food and Drink/REX USA. Nutritionist and personal chef Natalia Hancock knows that snacking is part of the human condition: “We’re programmed to seek out food; the trick is to munch on snacks that are healthy and easy.” When creating Rouge Tomate’s bar menu (Hancock is the culinary nutritionist for this healthy Michelin-starred, Upper East Side restaurant), she rejected calorically dense bar nuts in favor of humble popcorn, a whole grain with a generous dose of fiber. But, Hancock purified and glamorized this movie snack staple by replacing butter with olive oil and adding unusual seasonings. Why you should sneak your homemade popcorn into the movies: According to Hancock, movie theater popcorn is usually popped in refined coconut oil, so it absorbs lots of saturated fat. A medium-sized movie popcorn is well over 1,000 calories and can have more than 50g of saturated fat. 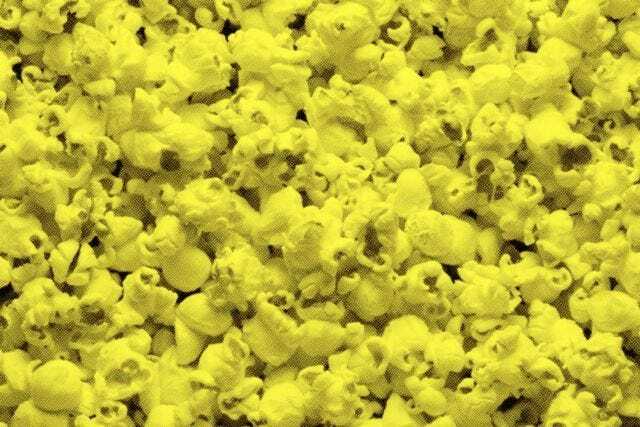 In comparison, one cup of air-popped plain popcorn is just 31 calories, and it doesn’t taste like styrofoam packing like the theater-variety. Two cups is a serving, says Hancock, but if you feel the need to pig out, air-popped popcorn is a safe food to overdo it on. Popping technique: No fancy equipment needed, Rouge Tomate uses a $30 hot air popper. If you don’t have counter space for an air popper, Hancock suggests putting a few tablespoons of popcorn kernels in a brown paper lunch bag and microwaving on high until there’s three to five seconds between pops. Once popped, put your popcorn in a big bowl and dress with one of the following Rouge Tomate signature toppings. Toss with extra virgin olive oil (1 tsp), sea salt, cracked black pepper, and a 1 tbsp grated Parmesan. Toss with lemon-infused olive oil and sea salt. Do you have any creative ways to dress popcorn? Tell us below!